There has been a worldwide growth in hydropower development, with 31.5 GW new capacity installed in 2016. This figure includes 6.4 GW of pumped storage – nearly double the previous year – while there is a further 20 GW of pumped storage under construction globally. This growth is indicative of impending pressure on hydropower in providing flexible support to renewable energy systems, as countries around the world take steps to meet the carbon reduction goals of the Paris Agreement. Paris agreement does not only push the sector, but it also pressures to finance this sector. Middle-income countries, especially the governments of Brazil, Russia, India, China, and South Africa (BRICS), are increasingly financing hydro and have become more assertive in advocating infrastructure development. Financial institutions have financed a number of controversial hydropower projects without thinking about the destruction caused to forest, land and livelihood of people. As mentioned in the earlier article, categorizing all hydropower projects as renewable energy is not only government’s agenda, but also that of private players, Financial Institutions, and other actors. India is also committed to focus on clean energy expansion. NHPC is a government-owned institution with an investment base of Rs. 38,718 crores. The authorized share of this Mini Ratna Category-1 Government of India enterprise is close to Rs. 15,000 crores, which is exclusively held by the Government. Apart from the central government funds, NHPC secures loans through commercial loan and bonds. As per the annual report of March 2017, long-term loan borrowing of NHPC stood at Rs. 17,246 crores, which comprised of Bonds, Secured Term Loans & Unsecured Foreign Currency Loans amounting to 8,493 crores, 4,479 crores and 4,274 crores respectively. The secured loans include borrowings from domestic banks and financial institutions like State Bank of India, Indian Overseas Bank, ICICI Bank Limited, Jammu & Kashmir Bank Limited, Bank of India, Axis Bank, State Bank of Patiala, State Bank of Bikaner & Jaipur, HDFC Bank, IndusInd Bank, Bank of Baroda, Central Bank of India, Kotak Mahindra Bank, RBL Bank, Life Insurance Corporation, Power Finance Corporation, and Rural Electrification Corporation. A number of innovative funding sources for hydropower project financing are coming up. Off late, an emerging trend is the rapid growth of bonds like Green Bonds, which are fixed-income loans created to specifically finance projects that help address and reduce environmental and/ or climate risks. Over USD 80 billion of labelled green bonds were issued in 2016, nearly doubling the previous year, but the market is still in its infancy. The Green Bond market intends to reach USD 1 trillion of investment per year by 2020 to be compatible with the Paris Agreement. Led by multilateral development banks and corporate sector, Poland became the first country to issue a green sovereign bond in late 2016 by raising $750 million. France followed this in January 2017, where USD 7.5 billion was raised. Other countries including Sweden, Nigeria and Kenya are expected to follow suit. The Indian Green Bonds Council, formed in late 2017 as a joint project of Federation of Indian Chambers of Commerce Industry (FICCI) and Climate Bonds Initiative (CBI), has launched its 2017 programme. India also issued its global green bonds worth USD 3.2 billion in April 2017 and made a position in top 10 globally. NHPC does not raise funds only from the domestic financial institutions but also from various international financial institutions, including export credit agencies. Multilateral Development Banks (MDB) like World Bank (WB), Asian Development Bank (ADB) and Asian Infrastructure Investment Bank (AIIB) can’t lend directly to NHPC. However, they (WB & ADB) have lent in a number of problem projects in India in the past. Apart from MDBs, there are a number of new bilateral agencies that are investing in hydropower through export credit agencies. As per the annual report of 2017, the current long-term borrowing from bilateral agencies — including lenders such as Deutsche Bank, Japan International Cooperation Agency (JICA), and Export Development Canada (EDC) — for NHPC stood at Rs 4,274 crores. In past, a number of other bilateral export credit agencies, like Germany’s KfW, Swedish International Development Corporation Agency (SIDA) and The Swedish Export Credit Agency (EKN), were involved. In 1990, after resistance by the Narmada Bachao Andolan (NBA) in Sardar Sarovar Dam (SSD), World Bank and other bilateral institutions stopped funding large hydropower projects in India. Despite the mounting evidence of its negative environmental and human rights impacts, the World Bank has restarted giving loans for hydropower in the name of clean and renewable energy. It has become more active in funding large and smaller hydro projects. Since the 2003 Water Resources Strategy, which stated that the World Bank would re-engage in hydraulic infrastructure, about 150 projects related to hydropower – including rehabilitation, technical assistance and Greenfield projects – have been approved. This represents a total of USD 13.6 billion in financing (USD 7.8 billion for hydropower components) and includes IBRD/IDA, GEF and Recipient Executed Activities. Roughly half of the 15 projects in the pipeline are in Africa. The World Bank is not just lending money but is also pushing many policy changes in the energy sector through ease of doing business index, and through its technical and financial assistance. All this would help them to prepare the ground for private players and corporations. World Bank’s ‘Ease of Doing Business’ initiative ranks countries on the basis of ten parameters. ‘Getting Electricity’ is one of them. For ‘Getting Electricity’, World Bank measures the performance on four parameters: (i) Number of procedures; (ii) Time for obtaining a commercial electricity connection; (iii) Cost for obtaining a commercial electricity connection up to 140 KVA; (iv) and Reliability of power supply. According to the Power Ministry’s website, India has made several reforms because of which India’s ranking has improved from 99 in 2015 to 26 in 2017. These reforms include regulatory easing as well as administrative easing measures. Apart from World Bank, Asian Development Bank (ADB) is one of the major financial institutions in the energy sector and is funding many hydropower projects in India and South Asia. In 2013, ADB committed equity investment of $30 million to help support development of NSL Renewable Power Private Ltd.’s (NRPPL) 100-MW Tidong hydroelectric project in Himachal Pradesh. It was its first equity investment in an Indian private sector renewable power generation company and also its first investment into India’s hydropower private sector. In 2008, Himachal Pradesh developed a program called Himachal Pradesh Clean Energy Development Investment Program, which was approved by ADB to expand the supply of power in the state. Under this scheme, ADB, along with German Development Bank’s KfW, co-financed 450 MW Shongtong Karcham hydroelectric project and three other run-of-the-river hydroelectric projects of Himachal Pradesh Corporation Limited. ADB is not only financing hydro projects but also has a major influence on policymaking in the energy sector. According to ADB, South Asian countries will be greatly benefited by a single interconnected power market that will also give India a chance to replace its fossil fuel-based energy with cleaner hydropower from countries like Bhutan and Nepal. Towards this end, ADB has committed USD 120.5 million in a mix of loans and grants to build a run-of-the-river hydropower plant in central Bhutan through a public-private partnership. Clean power generated by the plant will be sold to India, which will help in reducing its carbon emissions. 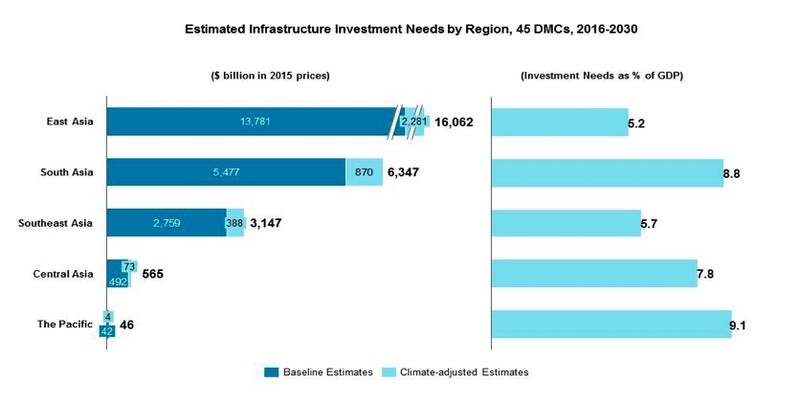 Recently, a report published by ADB on Asia’s estimated infrastructure investment needs mentions that out of the total climate-adjusted investment needs of USD 26 trillion by 45 developing Asian member countries over 2016–2030, USD 14.7 trillion will be needed for power. If one looks at South Asia’s needs, its total requirement is USD 6.247 trillion, including USD 870 billion for climate adjustment at GDP growth rate of 8.8 percent in which major investment would be required for the power sector. ADB has invested on many controversial hydropower projects in Himachal and Uttrakhand in the Himalayan range in India. The above figures also indicate that lending of ADB in hydropower will grow in near future. Apart from the World Bank and ADB, there are a number of other emerging key players in hydropower. The new players could be more harmful than World Bank and ADB as they have financed many controversial projects across the border. Their mandate is to lend in infrastructure, especially the power sector. Though World Bank and other financial institutions took a step back from hydropower in 1990, Chinese banks have stepped in the shoes of World Bank and ADB during that period. International Financial Corporation (IFC), a member of the World Bank Group, is investing USD 100 million in the landmark 720-megawatt Karot run-of-river hydropower project in Pakistan. Karot is IFC’s largest investment in the hydroelectric power project to date and represents IFC’s first major collaboration with China’s Export-Import Bank, China Development Bank, and Silk Road Fund. A large number of Chinese banks are globally financing hydropower projects. These banks and other Chinese companies are involved in 330 dams in 74 countries. Between 2000 and 2016, the Chinese banks and companies were involved in 39 hydropower projects across South Asia with approximately 19,000 MW capacity and a loan of roughly USD 30 billion. Out of these 39 projects, 21 projects were in Pakistan, 15 in Nepal, and 4 in Sri-Lanka. Though political relation between India and China is not amicable, the intervention of Chinese banks and Chinese companies in India is growing. The Chinese banks come with certain conditions, like having a Chinese financer, Chinese equipment provider, and Chinese builder. These conditions push the borrower’s country to compromise with their labour rights. The two new emerging Banks — New Development Bank, and Asian Infrastructure Investment Bank — are China-led banks with headquarters also located in China. Both the institutions aim to lend to infrastructure projects, particularly energy, in developing countries. These institutions are also pushing the hydropower in the name of clean and renewable energy. The New Development Bank has financed construction of hydropower plants in Russia by intermediaries such as Eurasian Development Bank (EDB) and International Investment Bank (IIB). This project was earlier supposed to rope in intermediary in form of Brazilian bank which has financed several controversial projects like Belo Monte Dam, which involved corruption and host of human and environmental rights violations. Similarly, the AIIB also wants to be ahead in the race to lend in hydropower. During its signing ceremony of MoU on the establishment of AIIB in Beijing, it had a USD 50 billion fund, which it planned to use to spur infrastructure growth in developing Asian countries with projects that include hydroelectric facilities. In 2016, AIIB’s President Jin Liqun and World Bank Group’s President Jim Yong Kim signed the first co-financing framework agreement between the two institutions to co-finance expansion of Tarbela hydropower plant in Pakistan. The World Bank and AIIB announced USD 720 million to help fund the fifth extension to the plant, which will add a further 1,140 MW in capacity. It is important to note that even if initially AIIB and NDB were projected as an alternative to the Bretton Woods institutions in the developing countries, these institutions are not very different, This is reflected not only in the similar policies but also coming together for co-financing large projects in Asia, and particularly on South Asia. The Paris Agreement not only pressurizes the countries to consider hydropower as renewable but also insists on finance it. At the same time, financial institutions are creating layers of financing model to escape from their accountability and transparency. It is important to keep eyes on emerging financial institutions and their nature of financing, which would do more harm to damage natural resources and peoples’ livelihoods. History has been witnessing displacement of millions of people, destruction of their livelihoods, and violation of human rights by these projects. *This is the last part of the two-part series on hydropower in India. The first part, titled ‘Big Push for the Development of Hydropower in India’ can be accessed from here.